Clint Thompson is in trouble. 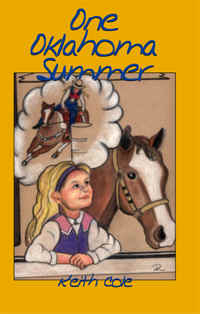 The famous barrel horse trainer faces a long, hot summer full of problems. The drought has hit hard, hay is scarce, and the money is running out. The ranch he and his family have owned for three generations might be lost. Twelve-year-old Mary Mitchell has problems of her own. She has moved to a strange new town with an uncaring father who is too busy for her. Somehow the old cowboy and the young girl find each other and face their problems together. Mary's quest to become a champion barrel racer becomes part of Clint's quest to save his ranch. Through good times and bad, they form an unbreakable bond of friendship. But their friendship is about to be tested and Clint has to make a heartbreaking choice Ð will he lose the family ranch or will he lose Mary forever.